Savings bubble to the top at Washington wastewater - Aquarius Technologies, LLC. Every wastewater treatment plant superintendent has a dream: An aeration system that doesn’t require frequent maintenance or plug frequently. The time and labor required to drain a basin, remove the sludge, inspect and clean the aeration system is quite costly. Many superintendents assume this is simply a cost of doing business. But it doesn’t have to be this way. Until recently, Mike Sowers, operations manager of the Birch Bay Water & Sewer District in northwestern Washington state, faced similar challenges. But then he discovered a fine bubble aeration system from Aquarius Technologies that changed his thinking. The district serves a community of 7,000 people in an area just south of the Canadian border. Its population more than doubles during summer months, when vacationers arrive to enjoy the lush vistas of this Pacific coastal region. Two years ago, these large annual variations in wastewater volume were pushing the Birch Bay water treatment plant to the limit. Birch Bay, with the assistance of a local engineer, developed a request for proposal which included evaluation criteria. After evaluation, Aquarius Technologies was selected based on lowest “life-cycle” cost (Combined purchase, energy, and maintenance costs over the expected life of the equipment). Aquarius was awarded the design and supply of a new fine bubble aeration system for retrofit into the existing basin. “We looked at a number of systems, but Aquarius was the most efficient,” he recalls. “Because it’s so energy efficient, we were able to get a grant for $117,600 from Puget Sound Energy to offset our investment in the new equipment. The design and installation process went much easier than expected. The blowers and underground piping took several weeks, but diffuser manifolds and associated piping arrived partially assembled, or with quick-connect fittings, so it only took the contractor a few days to install the diffusers, he recalls. 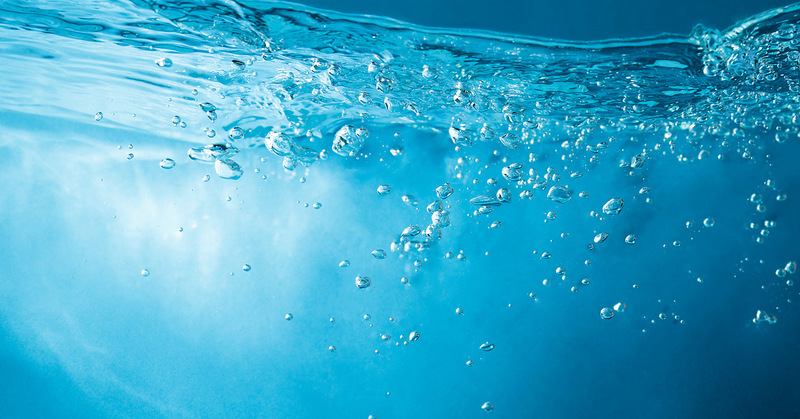 When Sowers analyzed the operating costs of the Aquarius fine bubble aeration system, he got a pleasant surprise: It was using 20% less electricity than the system it replaced. By extrapolating these cost savings into the future, he calculated that the new aeration system would pay for itself in as little as 15 years. It was also producing far more oxygen than the aeration system it replaced. “We had to figure out how to dial down its performance, so we could minimize the effects of nitrification taking place in the basins,” he says. In retrospect, Sowers is glad he avoided the temptation to select an aeration system based on the lowest-cost option. “It pays to invest in the system that’s right for your needs, not just the cheapest option,” he says. 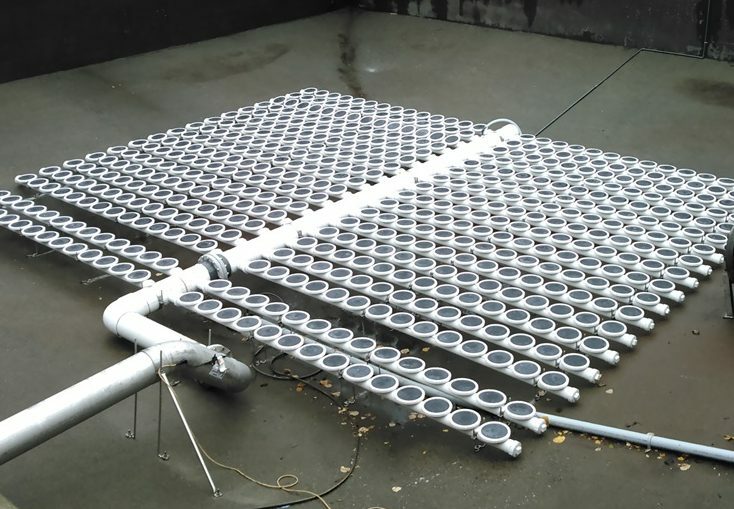 Based on Sowers’ positive experience with the Aquarius fine bubble aeration system, he returned to the same supplier to replace problematic diffusers in the plant’s pair of aerobic digesters with a new coarse-bubble aeration system. “Cleaning the old diffusers was a super messy, manual process,” Sowers adds. He explains that it usually took a week to drain a digester, remove the thick sludge from it, pressure wash the basin and refill it. Meanwhile, the other digester acts as a spare and continues to operate. “We always run one a bit on the low side, so we have excess capacity when we need to take the other one down for cleaning, It’s also helpful during winter, when inclement weather conditions may prevent trucks from reaching us for several weeks to haul sludge away,” he says. Sowers appreciates working with the small, highly responsive team at Aquarius Technologies. “I love that they offer application and aeration system design services. That means I don’t have to draw up detailed specifications, hire an engineering firm to design the aeration system and create a formalized RFP. All of that adds a lot of unnecessary cost and time to the process. Aquarius’ integrated approach is faster and much less hassle,” he indicates. Sowers has worked with larger firms in the past, but doesn’t like dealing with an ever-changing cast of people. “It gets to be a pain after a while. I really prefer working with smaller firms. Aquarius responds quickly to my questions. They have a wealth of experience in all aspects of aeration,” he emphasizes. For Sowers, it all comes down to managing his costs effectively. “Our costs are the lowest in the region. We’re pretty proud of that,” he muses. Selecting reliable equipment helps him to keep it that way. “The less time I need to spend on routine maintenance and cleaning, the better,” he concludes. This entry was posted in Uncategorized and tagged aerobic digester, coarse bubble aeration, fine bubble aeration, Lowers costs, Wastewater treatment plant.